Prior to the outbreak of war in September 1939, the German Army had focused exclusively on the operational, organizational and training preparations needed to wage war in continental Europe. The threat of an Italian collapse in North Africa in early 1941, however, prompted Hitler to reinforce his ally by sending an armored blocking force to Libya. Not content to merely thwart the British from capturing Tripoli, Lieutenant-General Erwin Rommel harried his inexperienced expeditionary force eastward towards the Nile Delta. This book is a pictorial narrative of the unfolding conflict from the arrival of the Deutsches Afrikakorps until Rommel's departure from the battlefield in March 1943. We view the desert war, with its shifting fortunes and unique challenges, primarily through the lens of ordinary combatants. This is their personal record of serving with Rommel in the desert. David Mitchelhill-Green is a freelance military author and photographer. His areas of interest include the Second World War and Japanese castles. 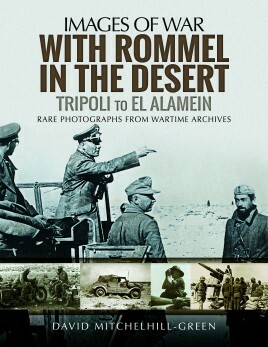 Previous books in this series include: Fighting in Ukraine: A Photographer at War, With Rommel in the Desert: Tripoli to El Alamein and Rommel in North Africa: Quest for the Nile.